Oh, hadn't seen that Disney version before, you are right, it is a bit similar. Of course, the Tree of Life is a quite universal concept. I am not certain what is next yet. I wrote about it a bit in the title post. 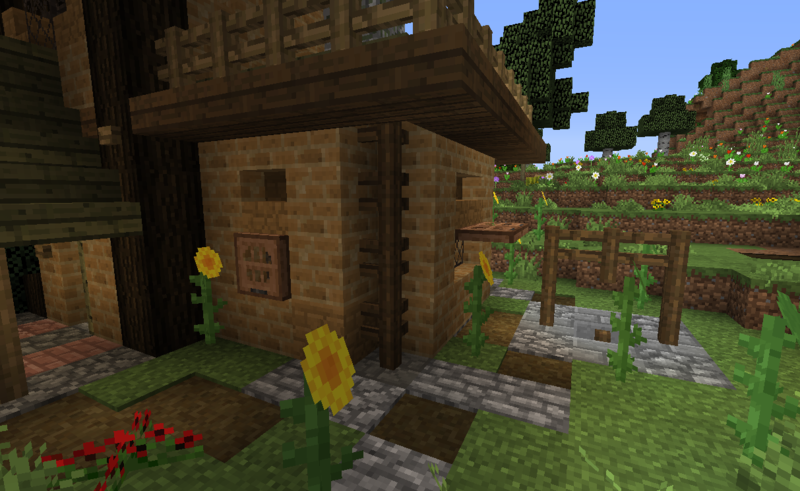 I am planning a continuation of Flower Valley as a mixed media creation; drawing art, building in Minecraft and writing a novel. The novel would be a story of personal growth where people from the desert village join the inhabitants of the more well functioning community in Flower Valley to create a new home the savanna to the north, occasionally assisted by a mysterious alien. It is a very rough first sketch of how an in-game location, and the result will probably differ a lot. Nice drawing! I hope you will share the story as it evolves. I've enjoyed following your build in this thread. Thanks for the dedication! Love the dedication to the sun, the moon and the Incas! I'll have to try and catch up on the rest when I can! I am really glad you loved it leangreen76! You will have time to catch up, since I won't be posting for a while - I am working on getting my home and web-page in really good order. Then I can come back to being creative again! 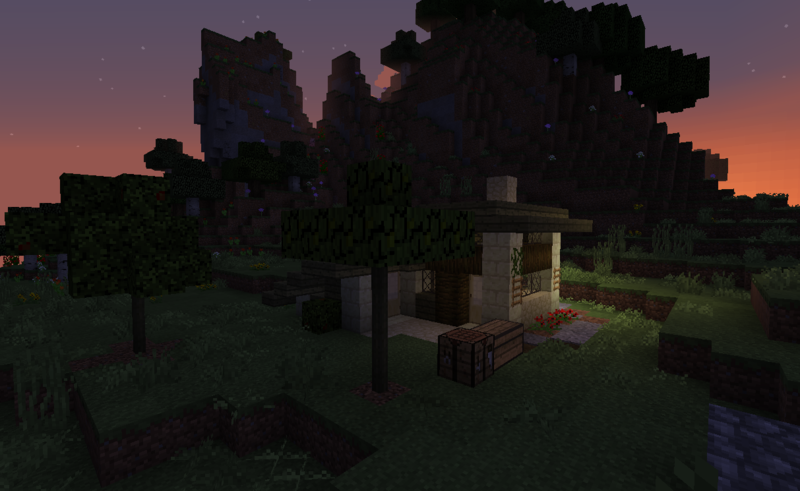 Just a quick update to say I hope to be able to update the world to 1.13 and continue journaling and building in it soon!!! 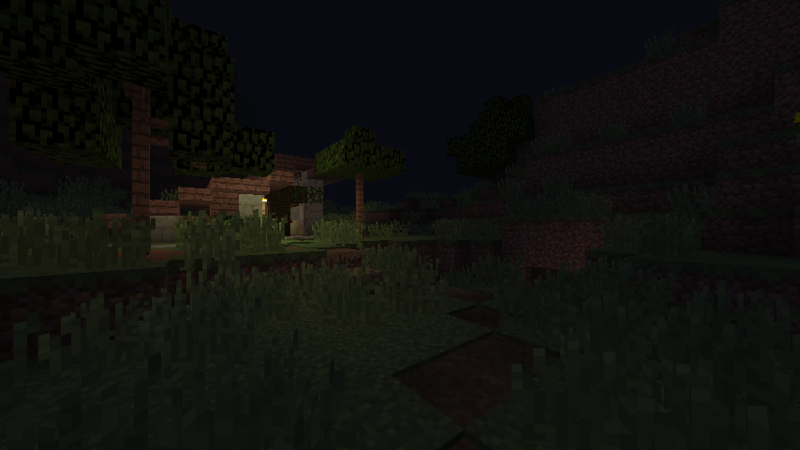 I have missed you Minecraft! 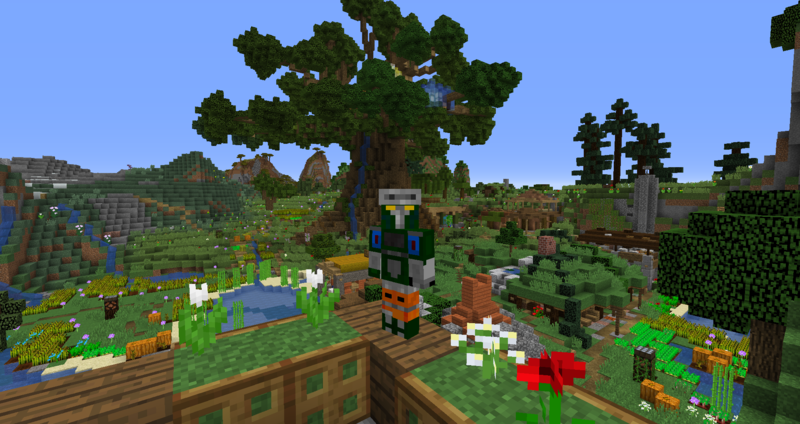 The world has been updated to 1.13 and is hosted on Realms! 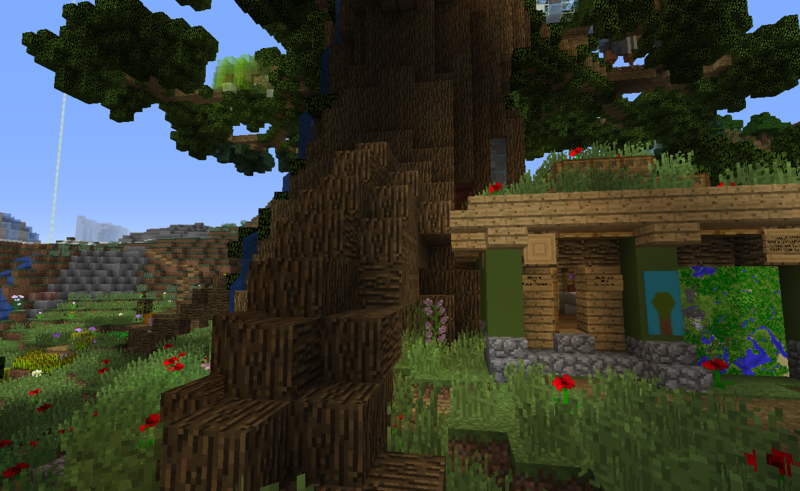 And, since Flower Valley finally is on 1.13 there are lot's of new stuff to explore PLUS with the new completely bark covered tree blocks there is the opportunity for a lot of improvement on the previous builds! The future of this world looks really awesome! 3 new episodes on YouTube for the Acacian Ascendancy! 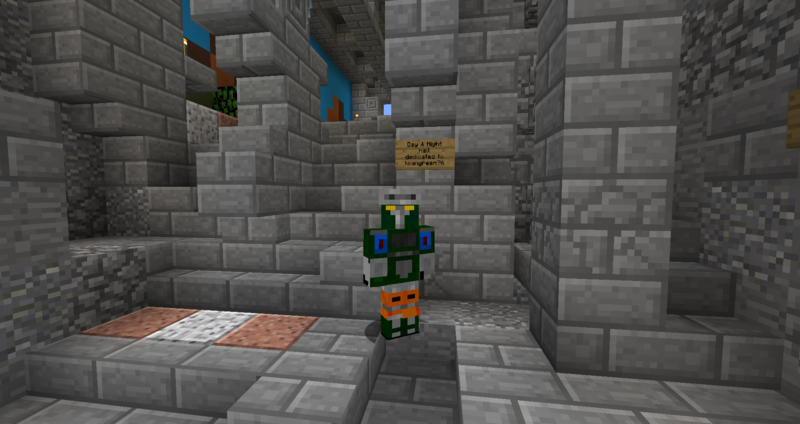 I tried OptiFine but it crashed, hopefully I can get it working eventually for a smoother experience. 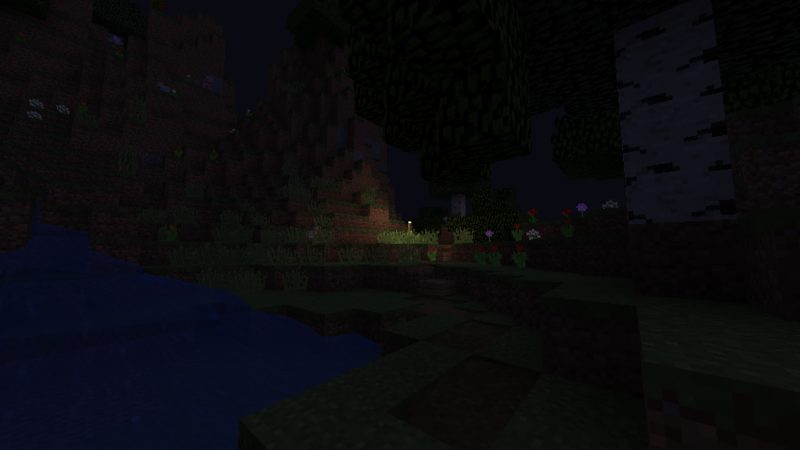 I might install shaders again later for more appealing screenshots! A teaser for what is coming up! 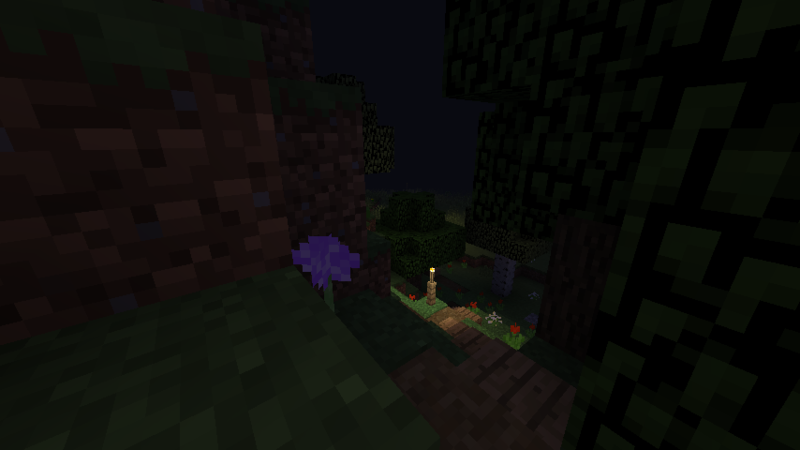 I am going to make an intro, flying and running around Flower Valley, along with some music I plan to compose next week! Other things are planned as well... but I won't tell you here yet!! 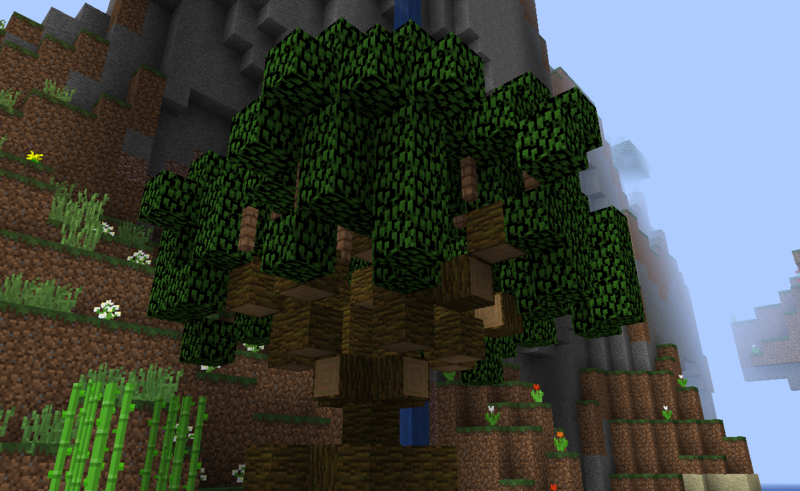 The new completely covered wood blocks are great for improving the trees in Flower Valley! 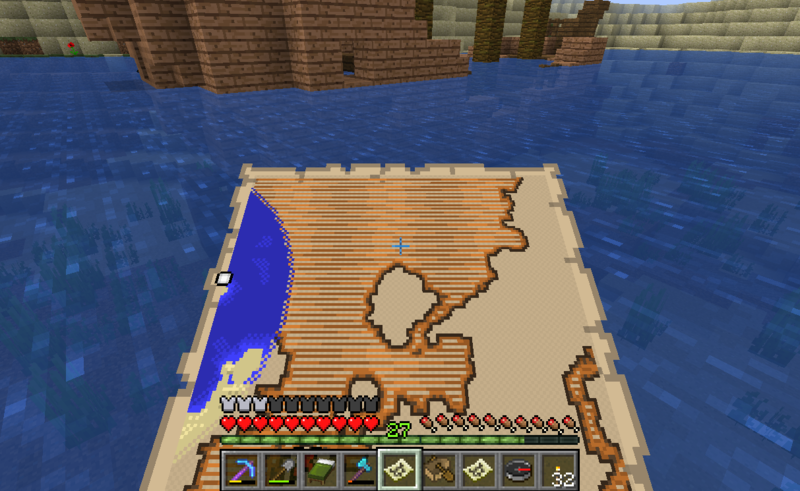 Roleplaying as Azu, the Flower Valley explorer and cartographer, travelled to the north! So much new stuff to explore. This journey lasted over six hours! 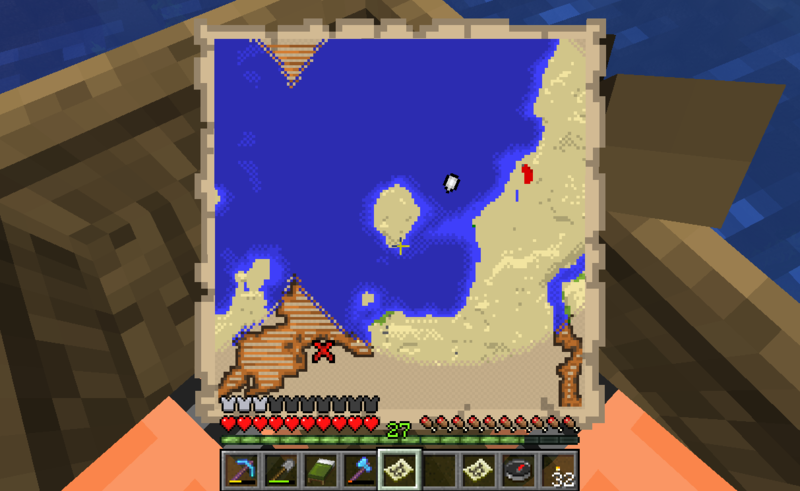 It took a while to find an ocean, I first traversed a lot of desert. 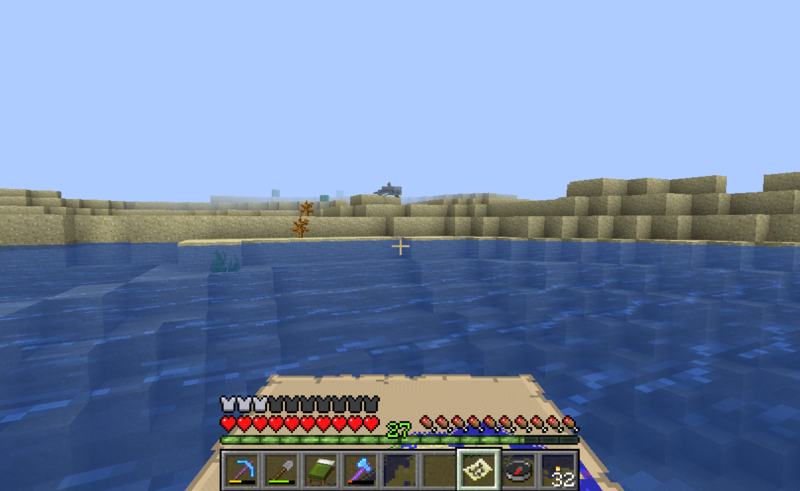 The first new thing I came across was sea grass. 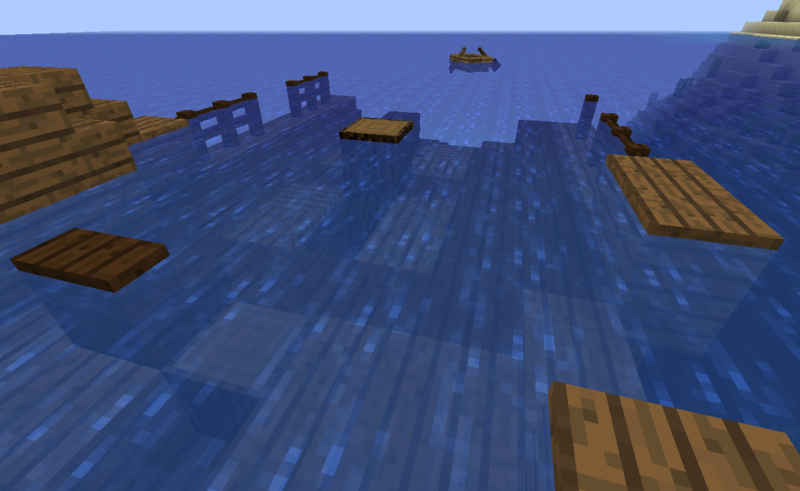 And kelp! What an amazing addition! Kelp really helps when playing vegan — or for anyone who wants some good sea food! Then I found another one, submerged this time! It seems a lot of patience is required to encounter baby turtles, I sat for at least an hour just watching while eating my dinner and browsing the web. Then I stepped on one by accident and was really sad! =( I hope it never happens again! 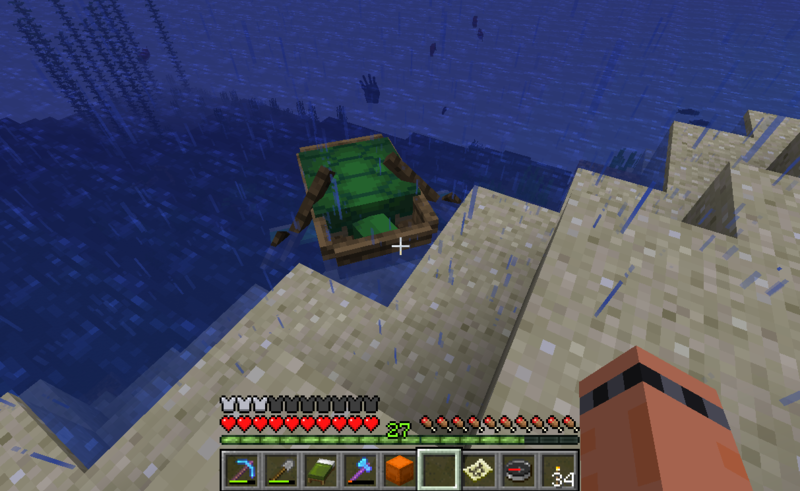 I finally left the egg watch, and found one of the turtles had occupied my boat. 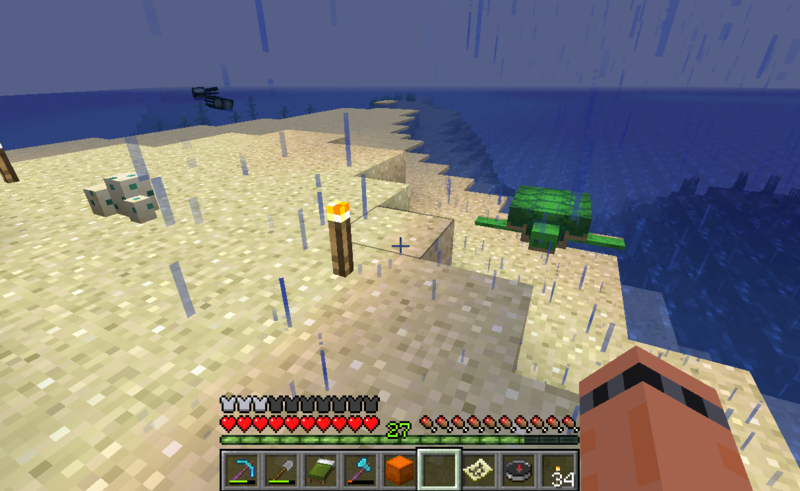 The turtle and I continued together for another hour. 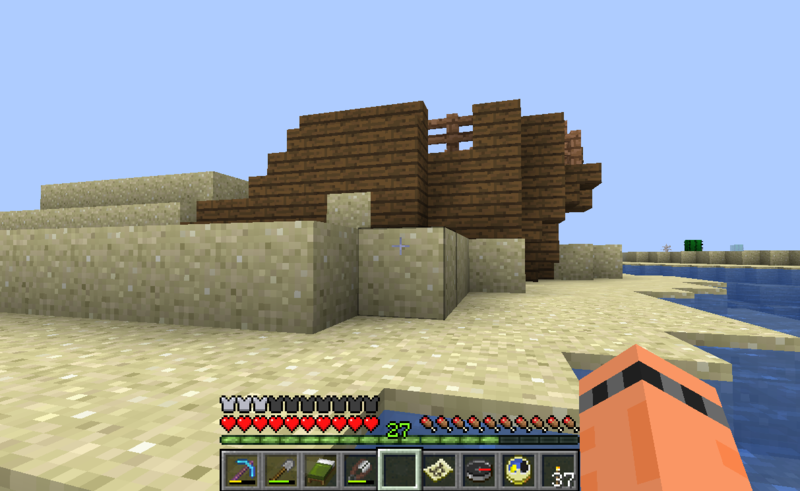 ... and found the third shipwreck. This was the best so far! Check the spoiler to see why.. 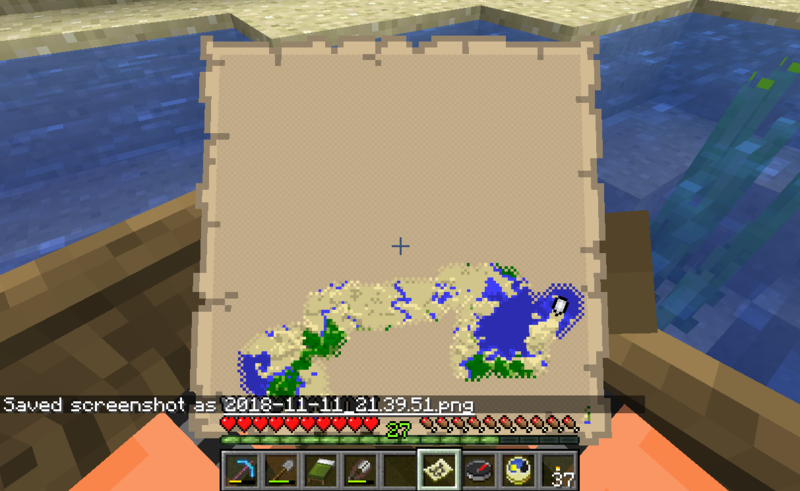 Yes, a treasure map! How cool! We had to backtrack a bit, but it was waaaay worth it! 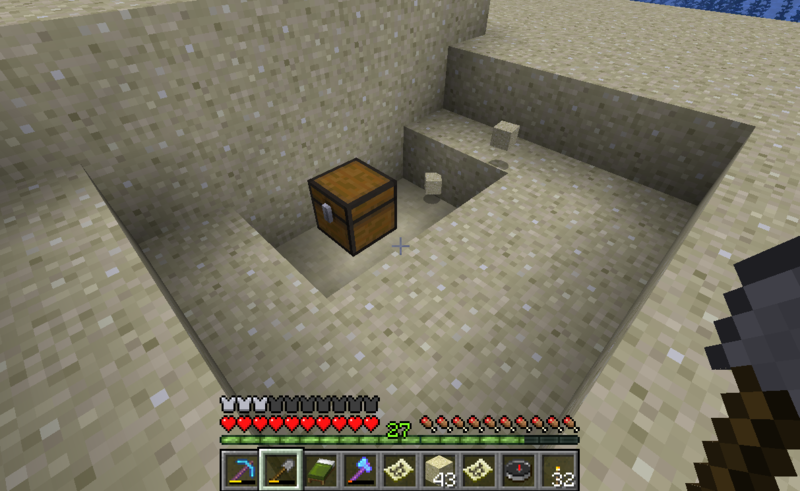 Turns out it was just next to.. 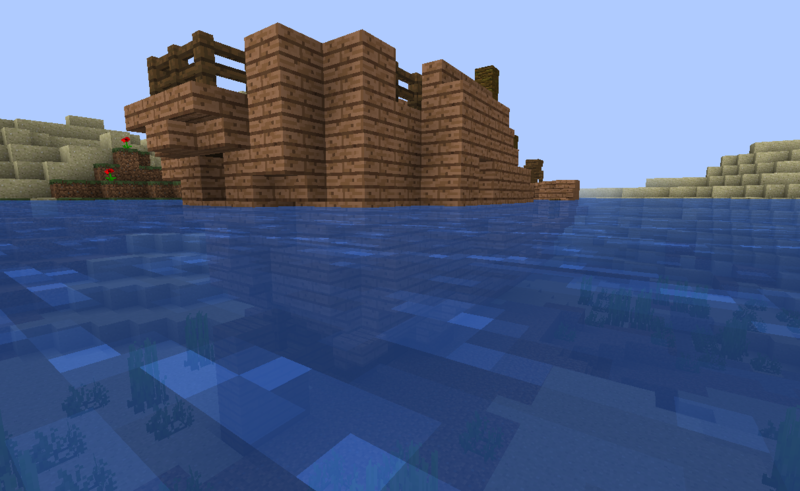 The shipwrecks kept coming, here was the fourth one, with a stone structure embedded in it. 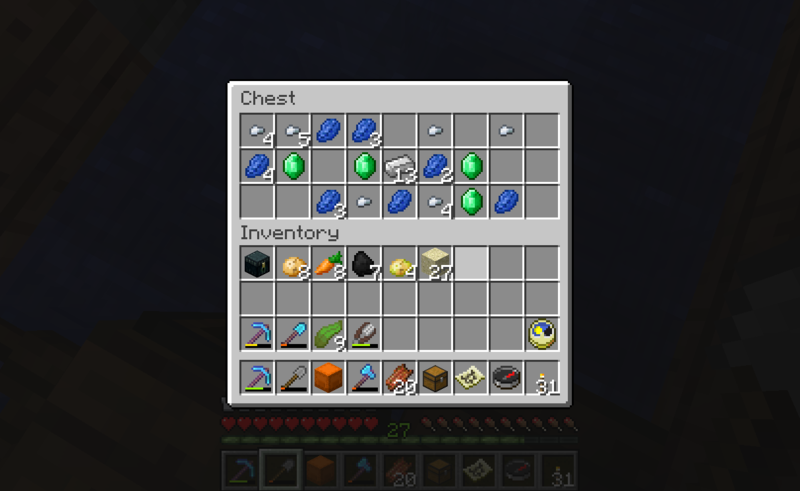 More emeralds for the chest in the Life Tree. 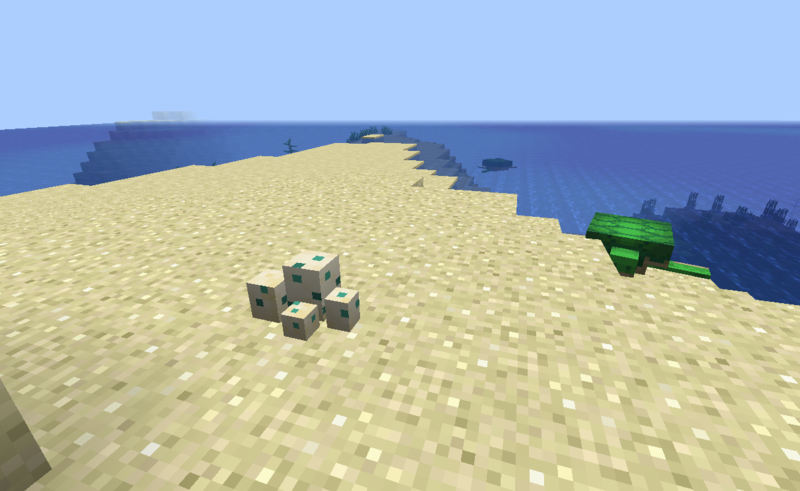 Lapis and iron nuggets. 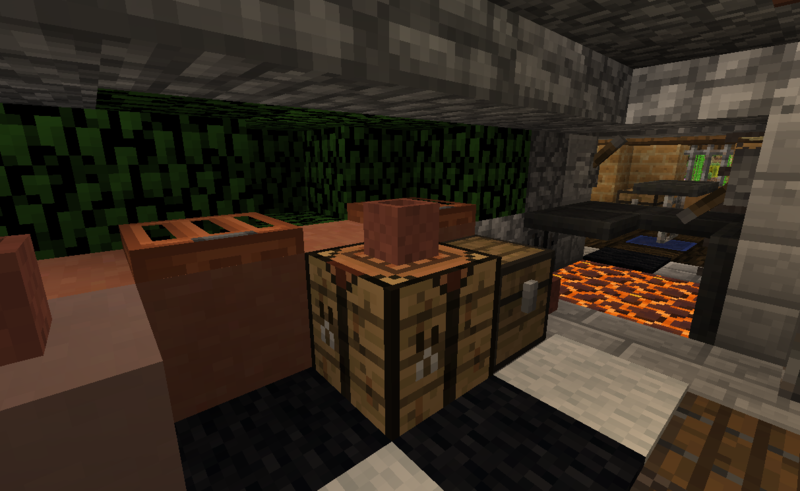 And glazed terracotta which will be used in the Acacian Ascendancy. I think I will role-play as my mystical self 'Avi' and try adding something truly alien and weird! 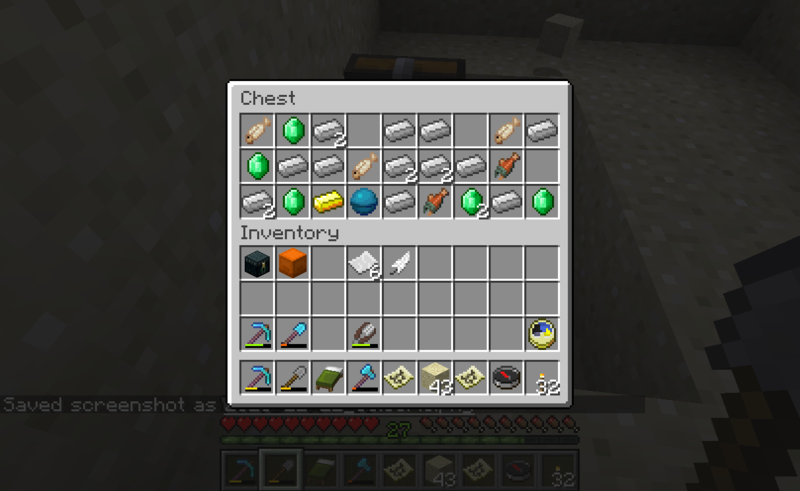 Hopefully I can involve some redstone in it too, should be a lot of fun! 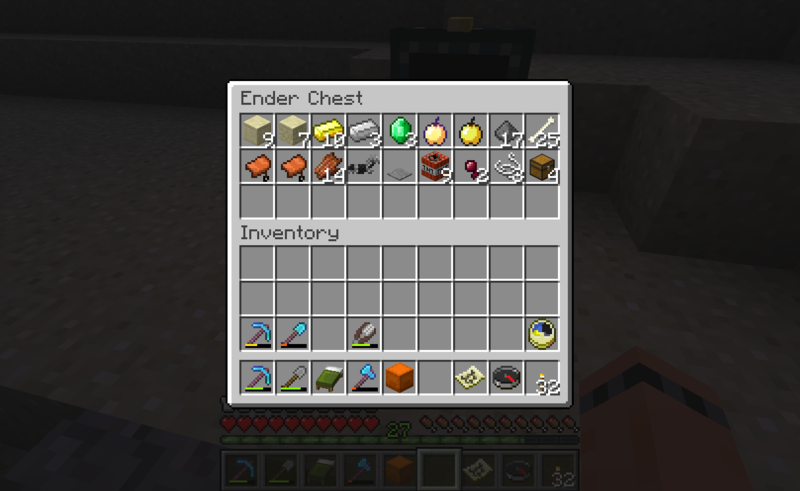 First, make sure you didn't miss the previous post, which is a proper journal entry! The series has an intro now! I know it can be improved (especially the music which has a few bloopers), but it is what I had time for this week. Just in the beginning of learning to edit videos. I'm using Kdenlive for editing and Audacity for extra audio work on Ubuntu 18.04 — working great for me so far! 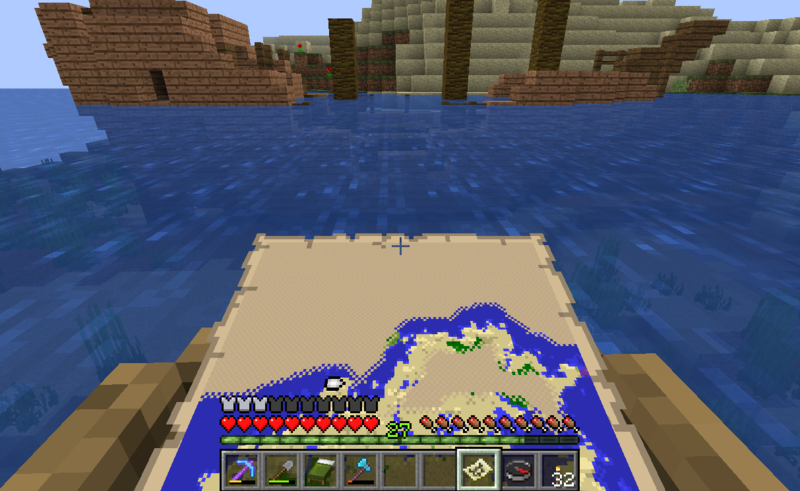 I finally downloaded your world! As soon as I started her up, I was wowed by the Tree of life - it's even more impressive in-game than the pictures and videos! 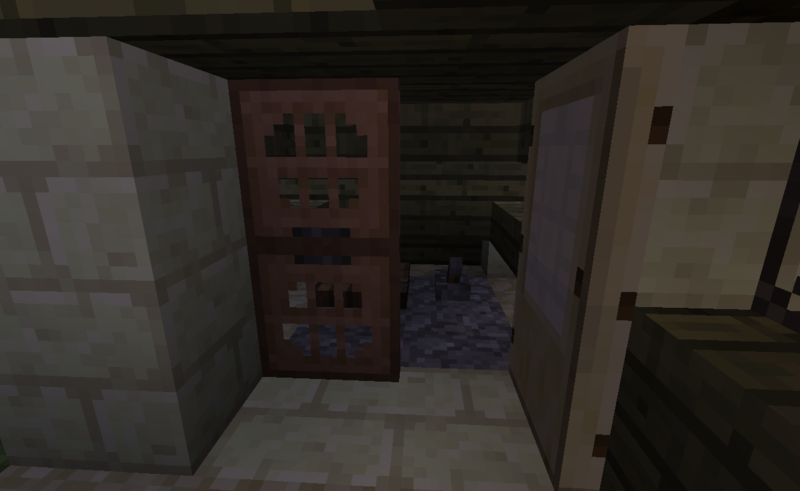 As I explored inside I was rather bemused by the musical chests, I really like them! 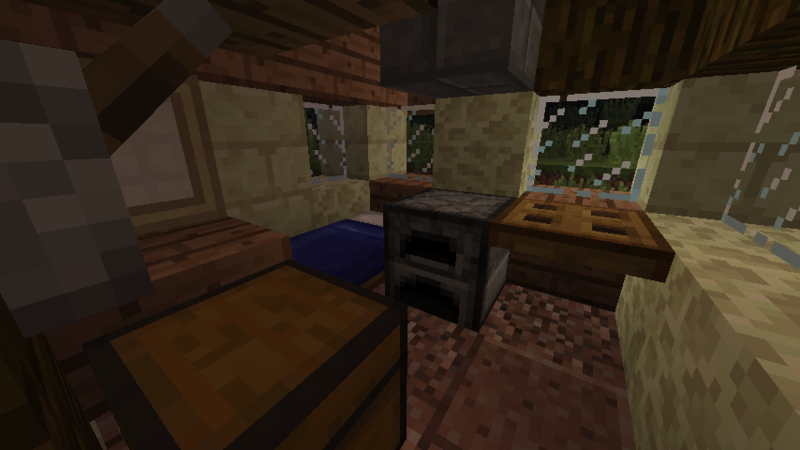 I like how all the interiors of the areas are though out like (Picking a random building) the pottery and glass making building, all over these little rooms have thought inside! 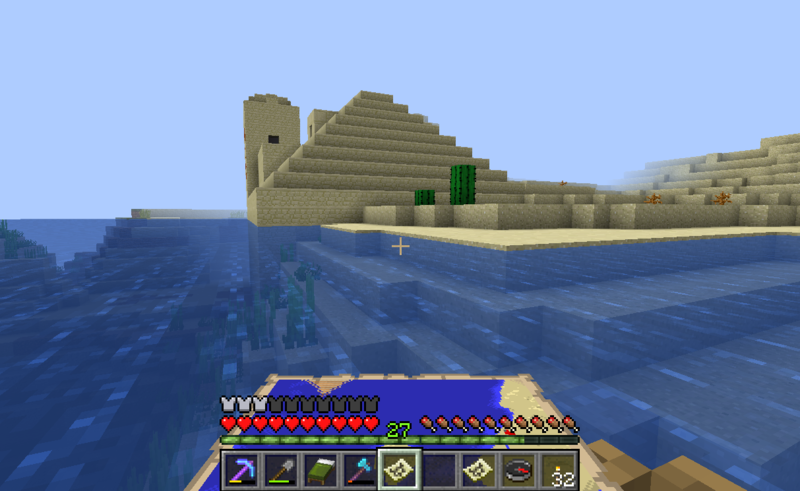 I also went (but not all the way) to the desert village. At first I could see it in the distance at the desert, but found myself on the log bridge crossing over and the nice little path leading towards it - there are few nice little paths running through! 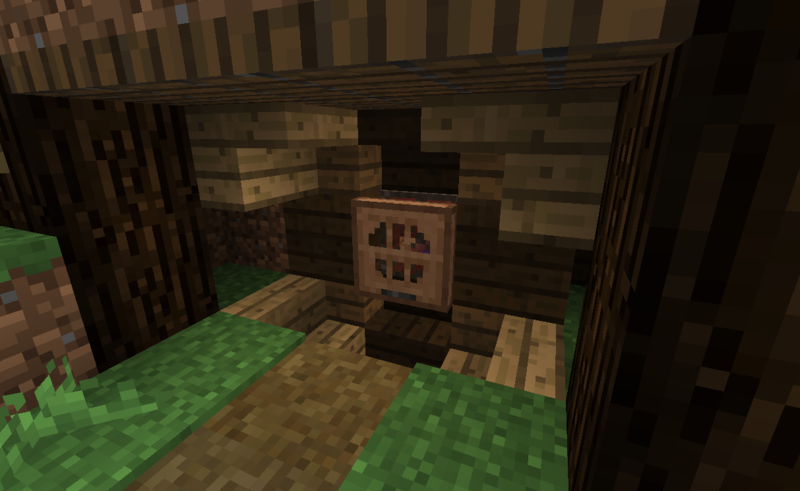 I also went to the extreme mines, and after an initial steep drop, settled into what was a nice little tunnel that the minecart ran through - very nicely decorated. Following signs down, reading quotes from Confucius, I remembered I got a dedication so went to find it. 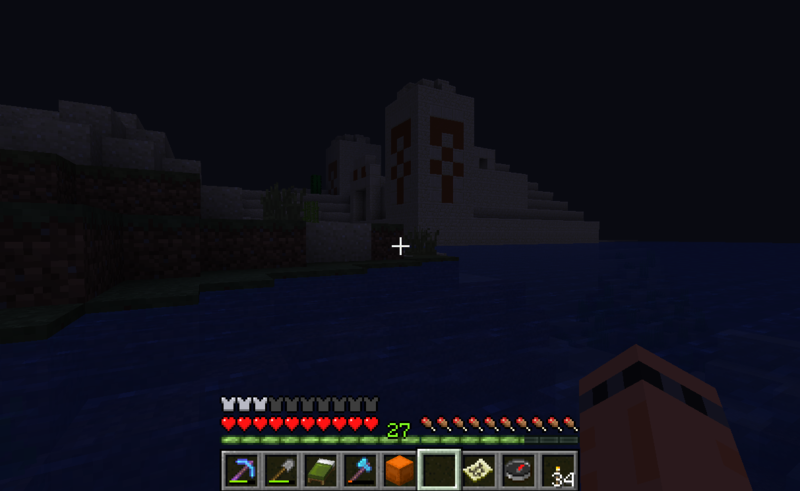 I found the library, the sacrificial fountain and dance floor and back-tracked and found... er myself! 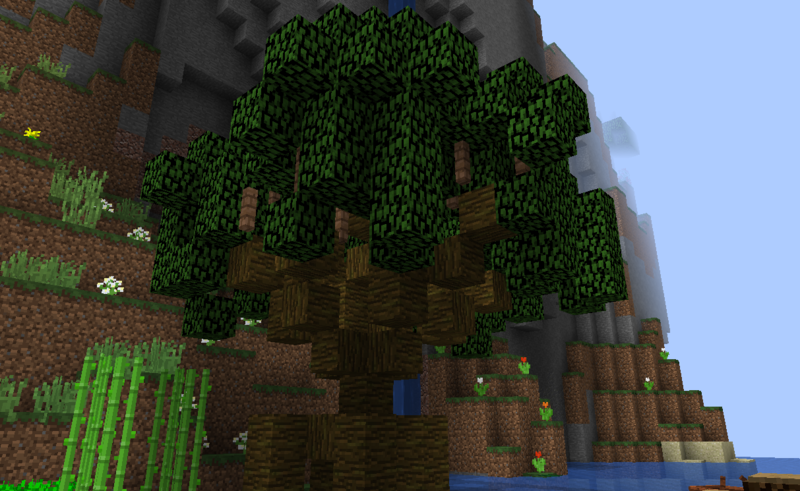 I got awed myself by the Tree, now coming back after some months without Minecraft, thinking, how the heck did I do this? It's really nice, I feel like it has become bigger than myself, it has taken on a life of its own along with the world. 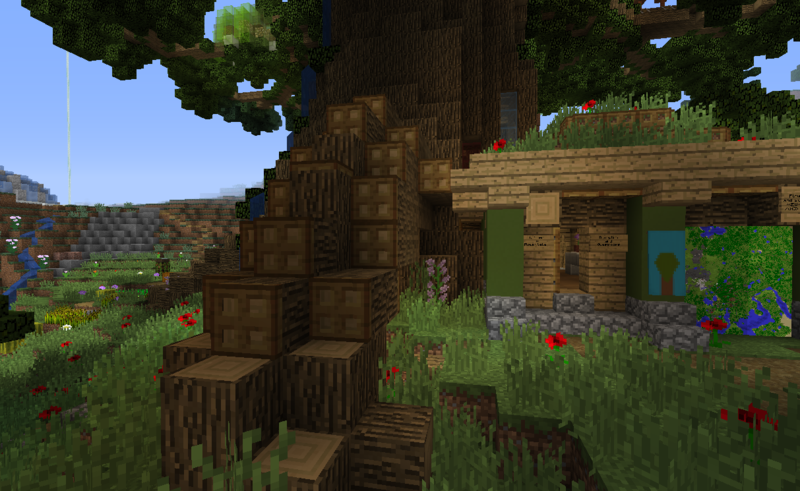 I am working on improving it, replacing the log blocks with wood blocks. 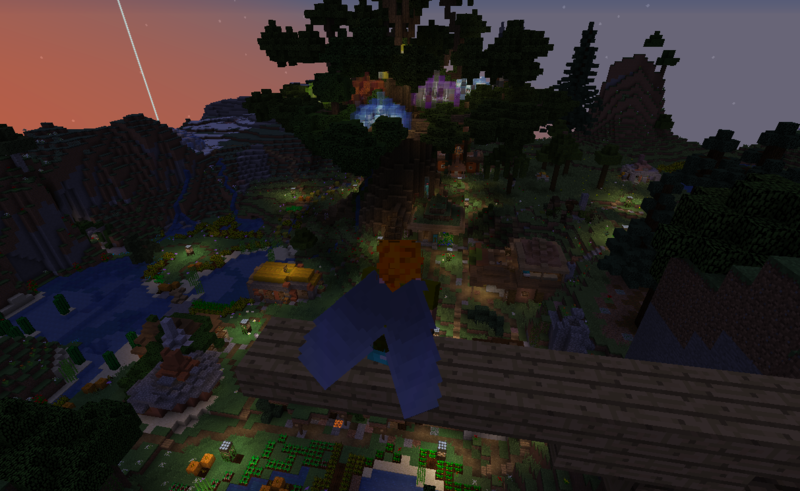 Hopefully the Acacian Ascendancy will be done come the end of 2018 for a 1.13 download along with an even more enhanced tree and an ender-themed build. About the small rooms, I think part of the credit goes to experts at medieval styled building I've followed. In particular Jamzieboy's YouTube videos and dukonred1's YouTube videos and Twitch stream. 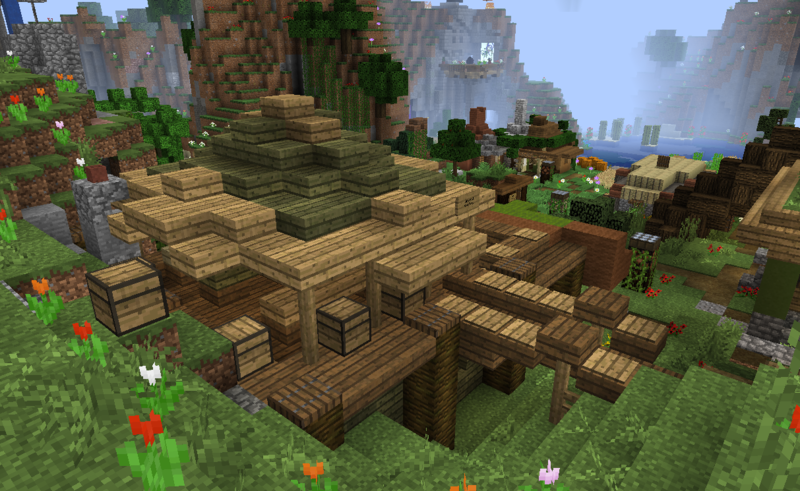 Both built/build on the Conquest server, which I also joined and built on a short while in 2016. Some good keywords I remember: Detail, Atmosphere and Purpose. I also think there a personal touch to the builds, else they wouldn't appeal. This is a beautiful reportage! It warms my heart to see you in the world leangreen76! 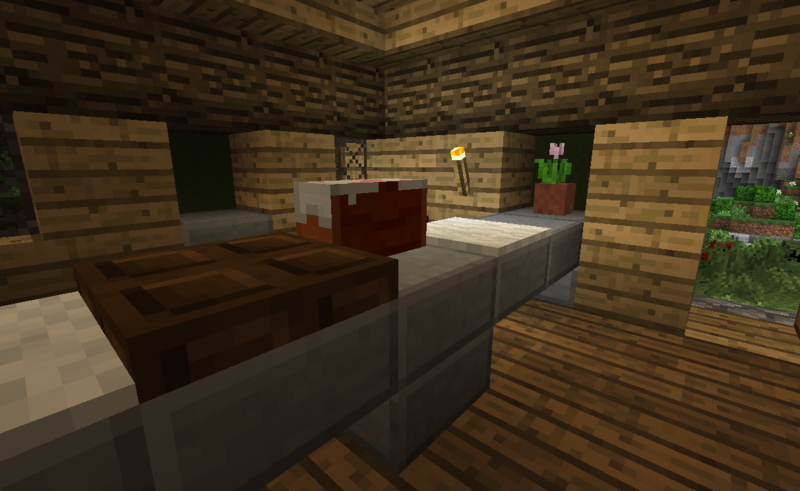 The skin looks so cool in the day & night room, it's like a perfect match and you look like a mysterious very inca-esque bird-human! And thanks for watching my videos!! I improved the audio by switching the headset, and further by applying normalization and noise reduction in a separate software from the video editor. There is a lot of room for further improvement; I want to connect a the studio microphone and the audio interface here at my parents. And then, I could eat better, practice my voice more and warm-up beforehand. While recording videos is challenging and fun, I have been missing this journal and the forums. 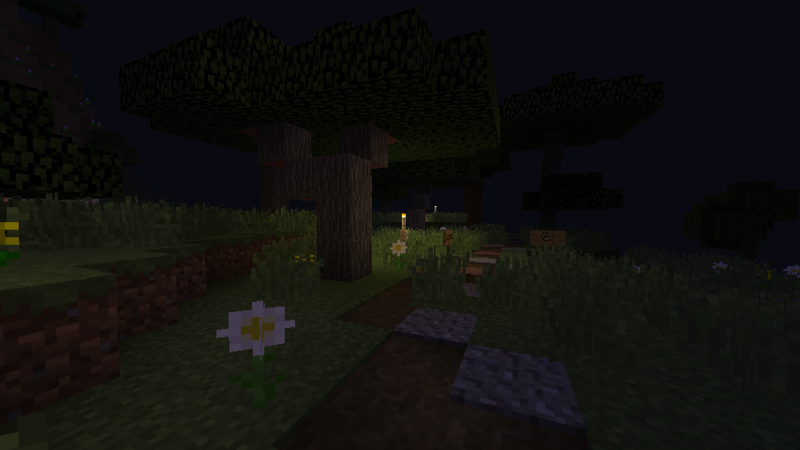 So, to remedy, here is a fun update on the latest changes I did to Flower Valley while streaming b³O last week. 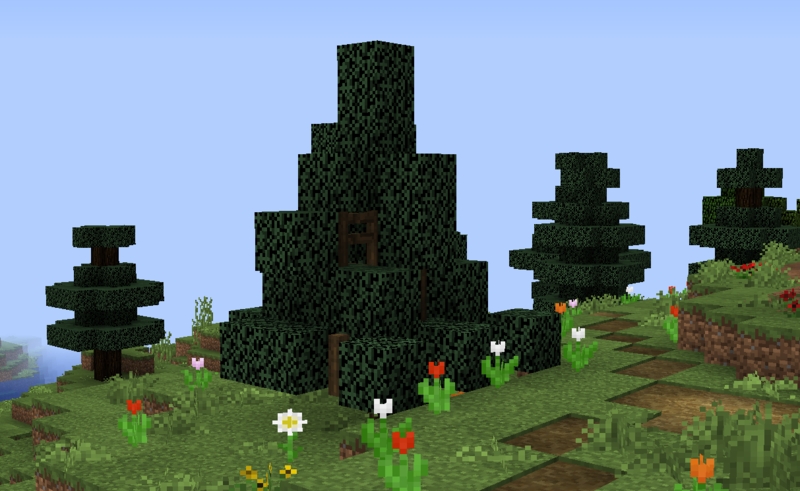 I thought the area of coniferous trees next to the woodcutters cabin needed a bit of variety, all trees there so far have been pretty large, so I decided to build a small larch. I am quite influenced by where I live at the moment, where the most common trees are birches, pines and larches. I was not super-happy with the result, but looking back it's not too bad. 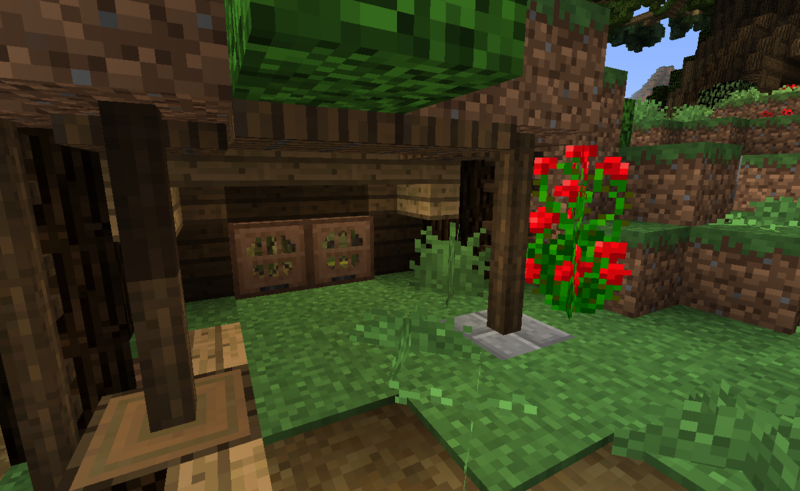 Perhaps I could a few blocks around the middle to make the branches more "larchy"
Next I remembered that update 1.13 has brought a unique trapdoor for each wooden material. I wanted to explore what I could come up with for each of these new designs, which I hadn't seen at all until now. 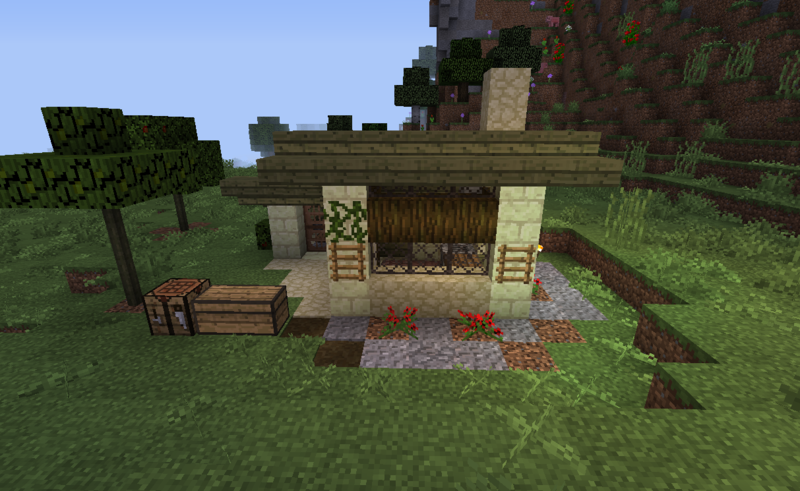 Excited, I began with jungle wood, placing one down on the ground out side the cabin.. 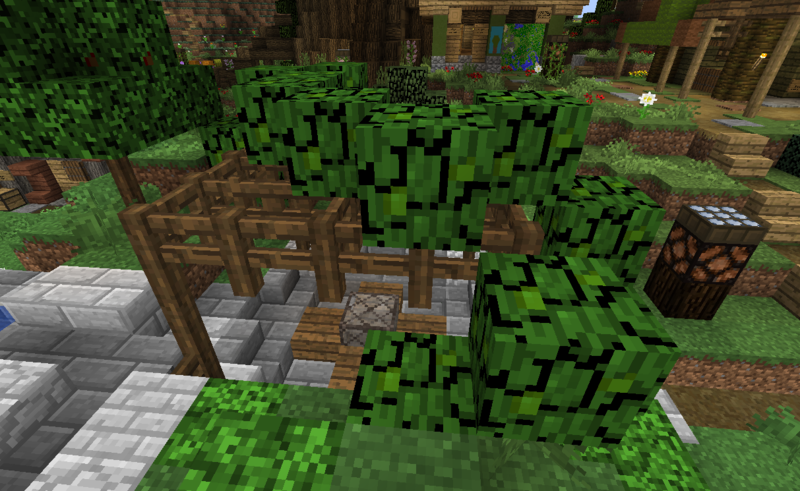 Here I removed the roses to make a little cozy sitting area instead. Next off was birch. Another fantastic surprise, these make perfect trays! Can you spot it, leaning against the wall in the corner? Another one fit well next to the food chest in the general store's kitchen. 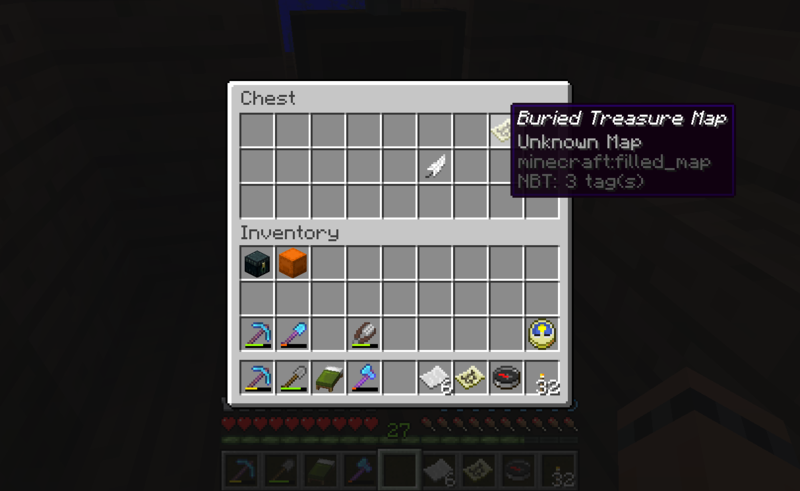 I thought I had gotten the best of this novelty already but the remaining trapdoors had even more unique applications! 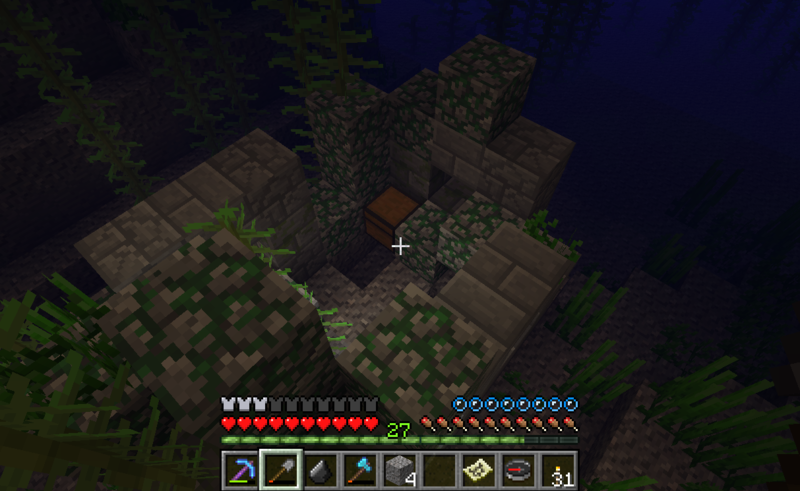 Placing down the acacia trap door, looking at this very open thing with just straight bars I was at first stunted. What could I possibly do with this? Do you get it? Hint: we are at the clay-, and terracotta workshop (the potter basically). Now we know how bricks are made! 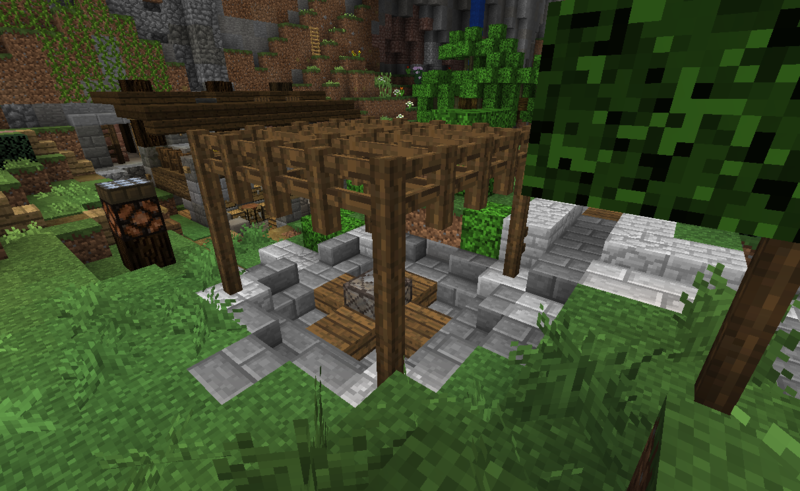 The acacia trapdoor is the brick cast! 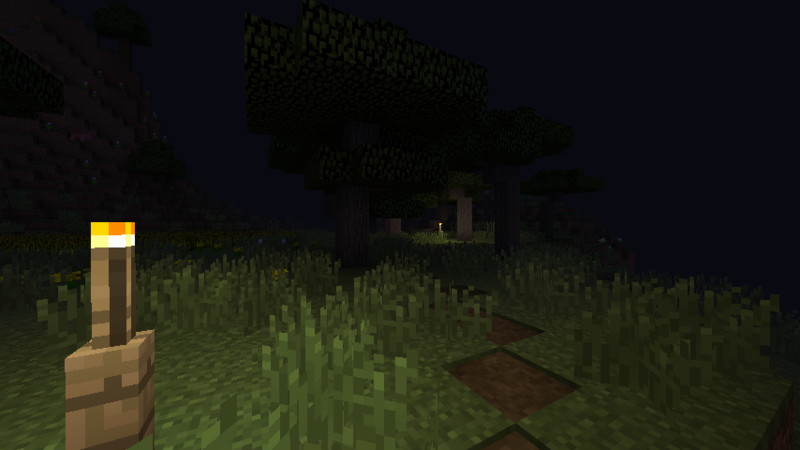 Finally, the dark wood. Instantly I just thought ... CHOCOLATE!!! Now the reception offers not only cake! and remembered a type of wooden structure I have both seen read about while living in Spain. 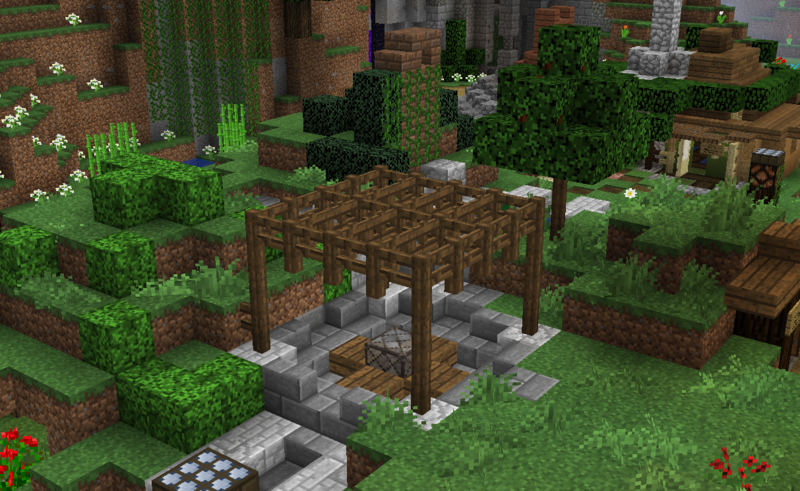 It's called a payola, and is a really nice feature to add in garden builds in my opinion. 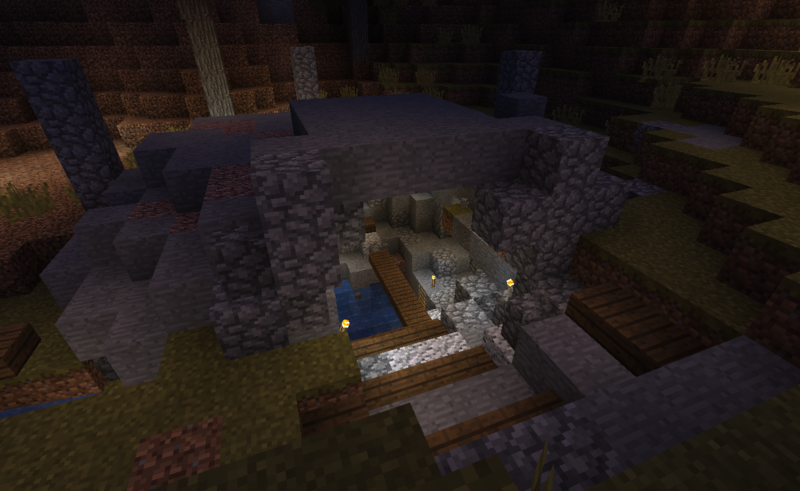 I built it on top of the seating area to break up all that diorite and grey smoothstone. Now with all roundness added I continued thinking in round terms. Looking at the wizard's house (where Fer lives in the story) the roof struck me as way too square. Why not make it more like a wizard's hat or a mushroom like those used for brewing in the cellar of the house. 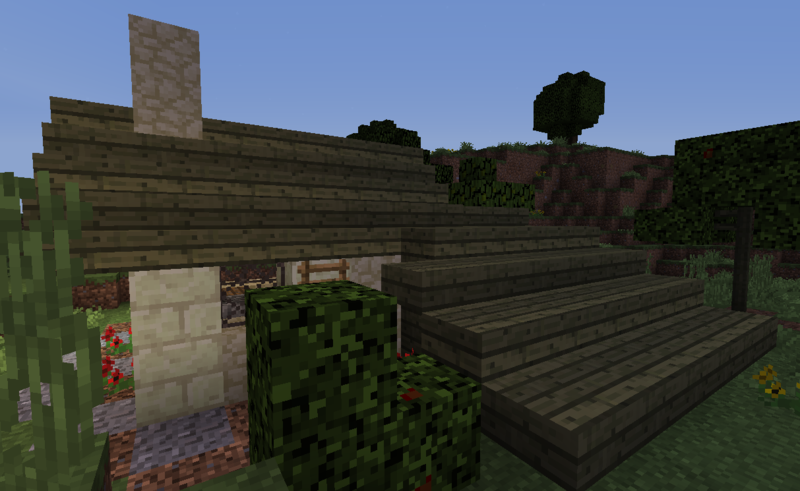 Finally I also rounded the roof of the workshop above the general store, one of the earliest builds which I was never too satisfied with. That's it for this update, hope you enjoyed! 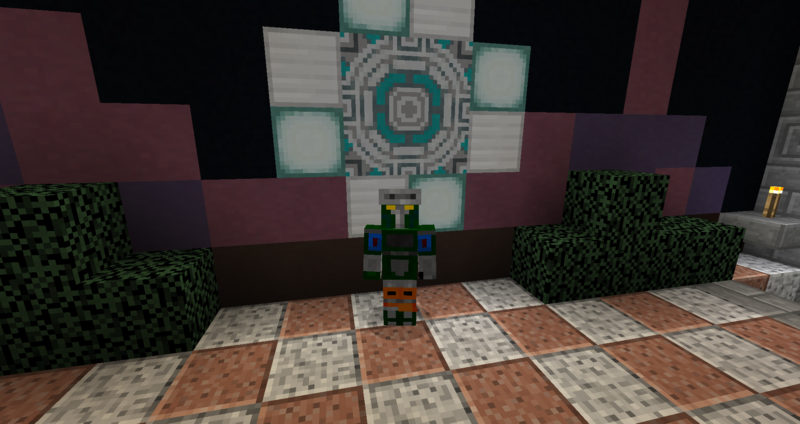 Next for b³O is another episode of the Acacian Ascendancy, perhaps even with a special guest, and then I might look into more new things to use in 1.13. Nine videos from building in the savanna north of the main area. Crazy how time flies! 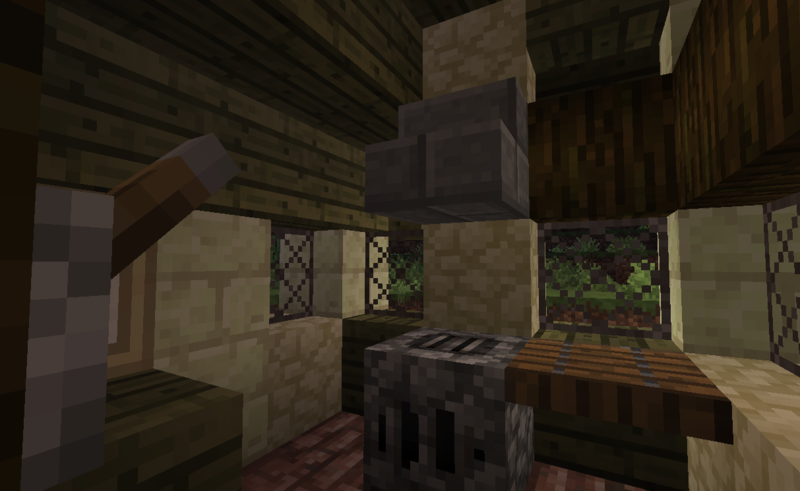 Episode 7 - Showing uses of trap doors (new in v.1.13) for interior decoration (same as in the previous post). 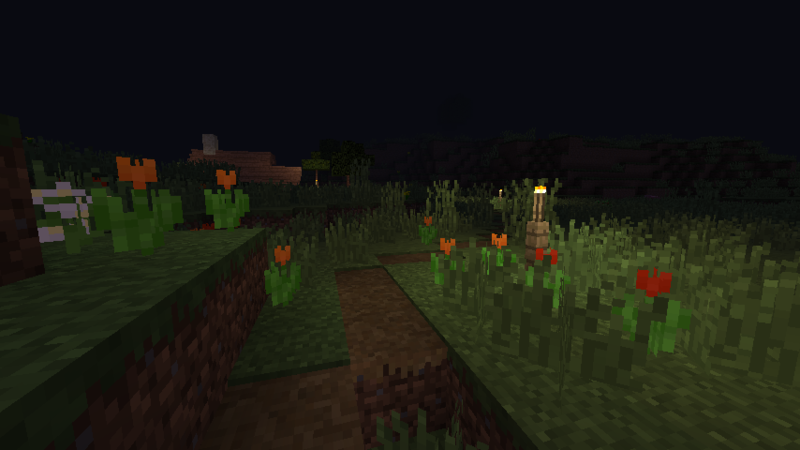 Gathering materials and crafting tools in Flower Valley. Filling the ground floor and placing support pillars for the second floor, along with walls and terrace. Episode 8 - Looking at progress in the transport tunnels. Adding irrigation to the terrace two fruit trees! Comment if you found something useful or have suggestions for improvements! And how many episodes will I need to finish this series and build?? Make a guess! I think... at least 10 more, I feel like a snail! Have an amazing morning/day/evening/night wherever whenever you are! I'm making my way through the new videos! It might take some time before I can offer some thoughts - but I'll get there! 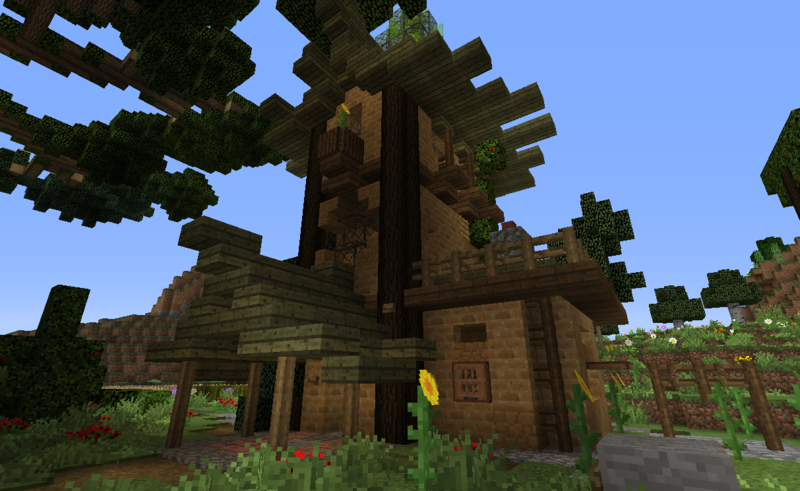 The 15th episode is coming up later today, including a little tour of the dedicated builds in the Adventurer's Hub. 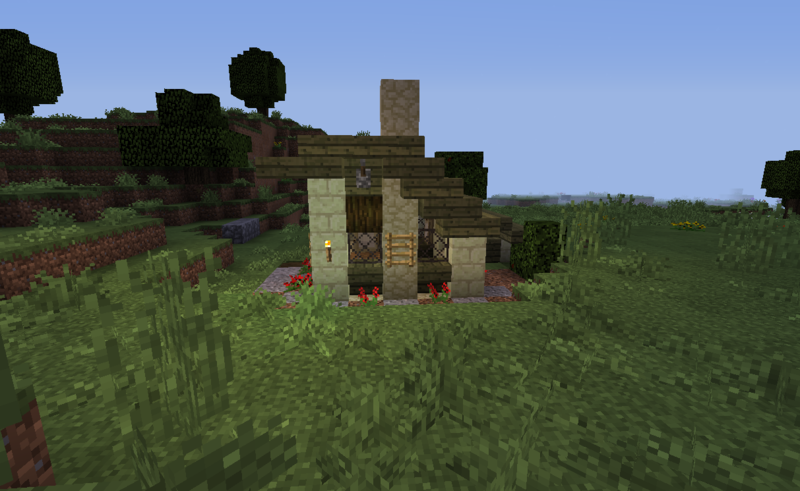 Finally, I got around to building with end-stone. And it took me even longer to get around to taking screenshots and making a post. But here it is. I have no screenshots from the progress building this.... instead I will give you an obscure one to begin with.. I know it doesn't look like much.. and the chest and workbench is left from the construction... pff ..how sloppy! We approach it as it lies among small fruit trees next to a natural cave. Ok, you have had enough of the dark. Me too. Let's look at the house in daylight. Starting from the back, looking towards the east. 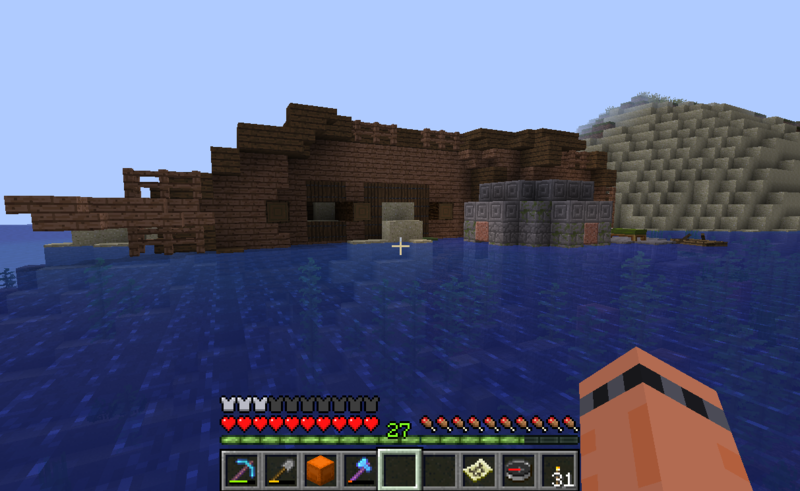 As we can see the house is really thin in the north-south direction, only five blocks wide including the walls. The asymmetric roof extends it a few blocks. We walk to the southwestern side and take a closer look at that roof. 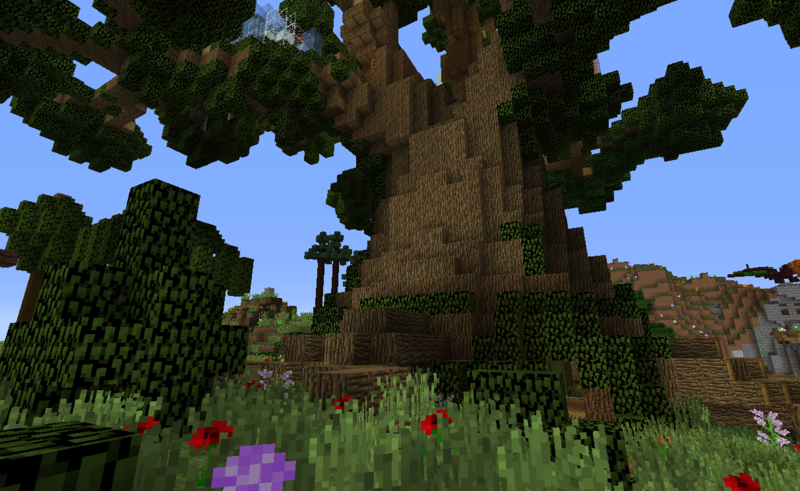 Jungle wood, who would have thought? As the roof extends almost to the ground it covers a shed. How does it look like inside? 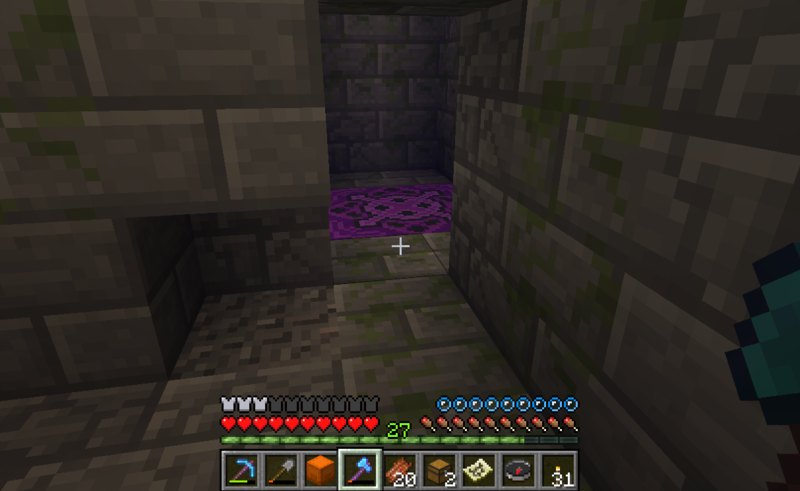 Hm.. cramped and full of end stone. But well ventilated! Going over to the northern side and looking down south.. the house appears pretty different from here, even if it has the same width. 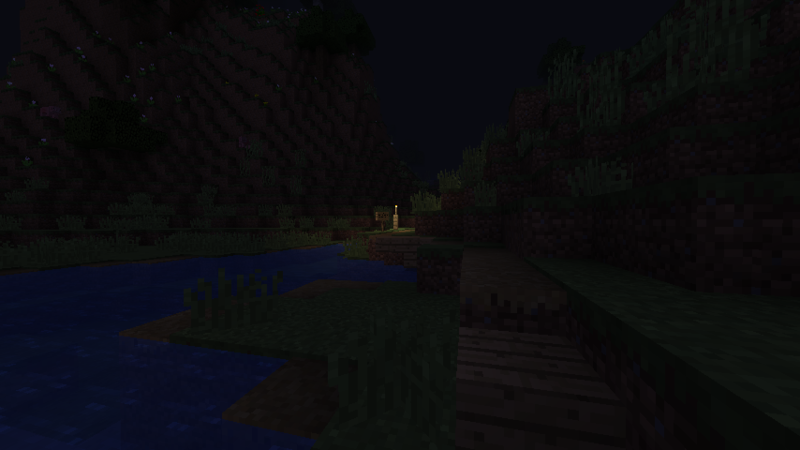 Could it be the wide windows and the jungle log giving a spacier impression? Ok now, enough exterior. Besides the inside of the house is the most important, that's where most time is usually spent. Are we ready to move in with our family of twenty? Eh. how about at least a bed! Ok, blue is my favorite color.. but OMG so cramped! 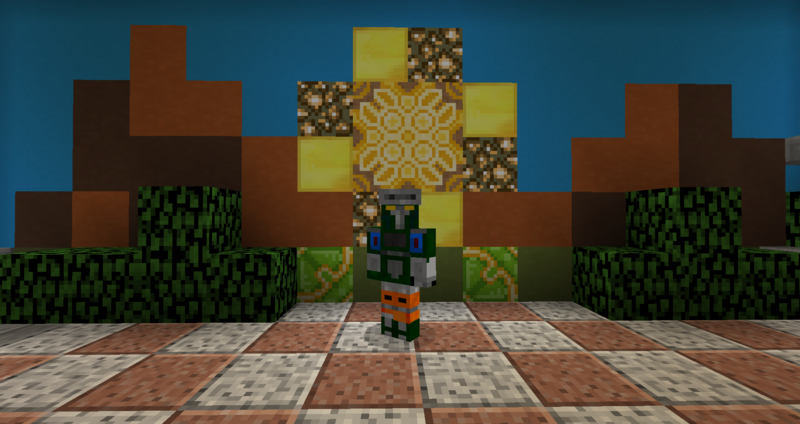 Hope you enjoyed this little build tour! The next post from me will be episode 14 and 15 of the YouTube Let's Build video series, the Acacian Ascendancy, in just an hour or two! Later than I announced in the last post, but here are the latest episodes showing the ongoing work on the Acacian Ascendency. I tried planning some episodes back, but didn't get it right, even if another time it worked really well, I don't know what's going on. So these are just me jumping in and trying to figure out what to do on the spot. I should probably do a review before recording since I tend to forget what has been done during the days between each episode. The idea was mainly to work on the interiors under the side staircases, but since the front entrance and staircases have been kind of messy and don't lead intuitively to the right place I try to improve them, and also do some landscaping around the building. 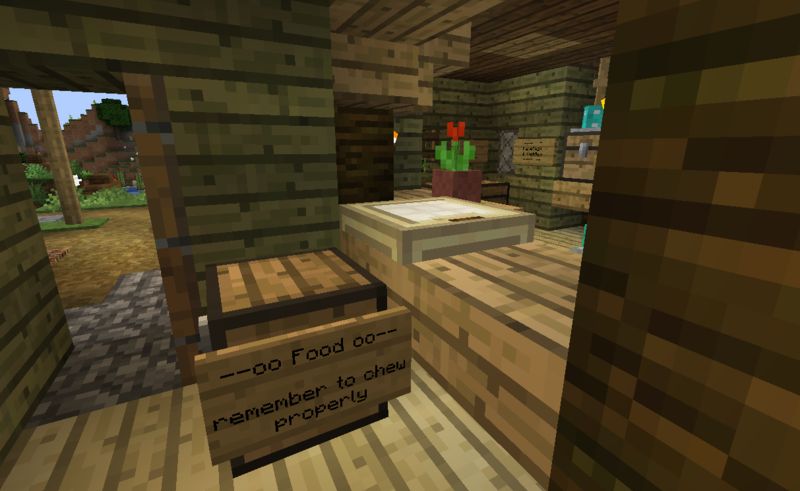 First I give a tour of the Adventurer's Hub, even reading the poetry =) This is most of the episode actually. But eventually I get over to the Ascendancy and decorate the bath and place lanterns in the ceiling on the ground floor. I think the place is getting a bit nicer, but I still feel it lacks, perhaps along the lines of order, harmony and purpose... suggestions are very welcome! A bit more planned than the previous ones, I prepared materials before (WOW, can you do that?! 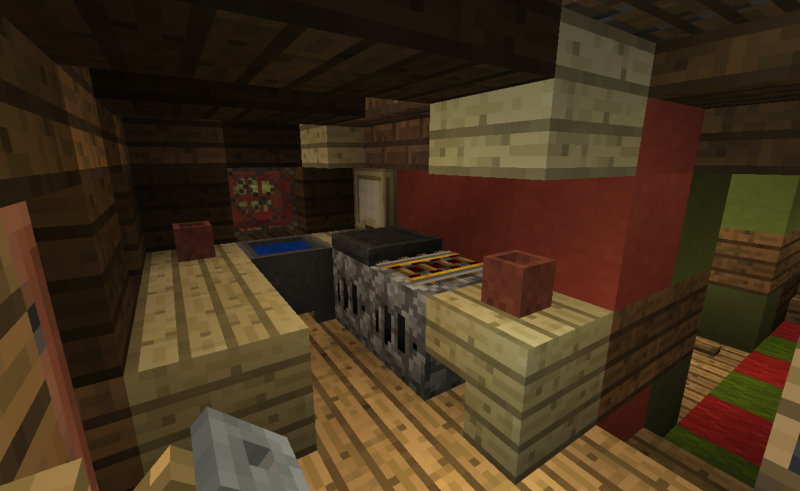 ?=) recording this time and built the kitchen and dining room on the second floor of the Ascendancy. Some scratching my head figuring out how to fit all 8 tables and chairs in the quite cramped small circular space around the central water pipe, placing new trapdoors as food trays. 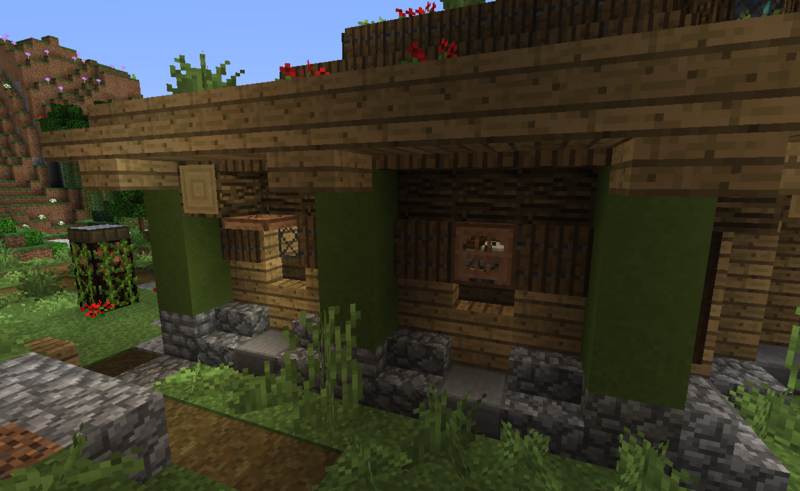 I also did some detailing of the part above the entrances in each compass direction using glazed terracotta, ladders and oak buttons which I quite like..